China's Vice-President Xi Jinping has had his status as the next leader of China confirmed at the fifth plenum of the 17th Congress of the Chinese Communist Party. In the Byzantine world of Chinese politics, this happened as Xi was appointed vice-chairman of the Central Military Commission (CMC) of the Party - making him heir apparent to Hu Jintao. Xi now joins President Hu as the only two civilian members of this powerful body. Xi's appointment was not a surprise. If he had not been appointed, it would have cast a shadow over the arrangements for the succession. China watchers had been reticent to make such a prediction as his appointment was widely expected last year. There has also been intense jockeying for position among the various factions within the leadership in the past few months. Xi's appointment was therefore not seen as a foregone conclusion. Xi is not Hu's choice for a successor. They have come from very different backgrounds and do not share the same factional power base within the Communist Party. Hu rose through the Youth League without relying on family connections. Xi, in contrast, is the son of Xi Zhongxun, a veteran of the Party from the late 1920s, which makes him an important "princeling". 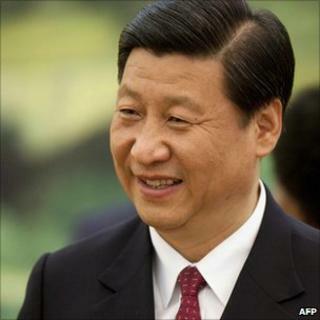 Xi also enjoys good relations with supporters of Hu's predecessor Jiang Zemin, popularly known as the Shanghai faction. Xi was named heir apparent not because of but in spite of Hu's preference. The appointment of the heir apparent to the CMC was part of the succession arrangement that became institutionalised after the death of Deng Xiaoping in 1997. Deng was the last Party strongman who functioned as the paramount leader without holding the top positions. Since Deng's death, China's leader is expected to hold the top offices - as General Secretary of the Party, president of the state, and Chairman of the CMC. The new practice for succession is for the heir apparent to be named five years in advance. He is expected to serve as vice-president of the state, head of the Central Party School, as a member of the Standing Committee of the Party's Politburo, and vice-chairman of the CMC. The last post in fact consists of two parallel offices with exactly the same title and membership - the Party's Central Military Commission also exists as the state's Central Military Commission. Apprenticeship as vice-chairman is meant to prepare a new leader to take the reins of the armed forces. When Hu succeeded Jiang Zemin as party and state leader in 2002 and 2003 respectively, Jiang held on to the chairmanship of the CMC for two more years. It appears that Hu intends to do something similar when he hands over to Xi in 2012-3. Unless Xi makes some spectacular mistakes in the next few years, he will succeed Hu. Xi's appointment to the CMC suggests that the succession arrangement agreed in the 2007 has been reaffirmed, despite tension among the major power blocs within the Party. The top leadership remains united in its primary objective, which is to signal to the rest of the country its commitment to stay in power and not allow internal disagreements to split it. This is meant to reassure the public that stability and order will be maintained, and show that the party leadership share a unity of purpose in meeting challenges, be it economic slowdown or the awarding of the Nobel Peace Prize to jailed dissident Liu Xiaobo.